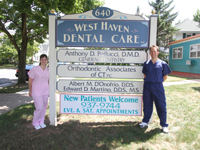 Welcome to West Haven Dental Care - Dr. Anthony D. Bellucci, D.M.D. When it comes to your dental health, it is important to have a dentist you can trust to help maintain your smile and confidence. At West Haven Dental Care, we will provide you with the services needed to achieve healthy teeth and gums in a comfortable and professional environment. Since 2003, we have been providing comprehensive dental services to patients in the West Haven, New Haven, Orange, Milford and surrounding areas. Dr. Bellucci goes out of his way to make sure every patient feels welcomed and relaxed during their appointment. West Haven Dental care provides the highest quality dentistry for children and adults of all ages. We offer a range of dental services including preventive, restorative, minor surgery, cosmetic, pediatric, and implant dentistry. We pride ourselves on being a patient-centered practice. We do everything possible to make our patients visits unique and pleasant experiences. Dr. Bellucci and his staff stay up to date with any changes occurring in the world of dentistry to ensure we are providing the highest quality of care. We take the time to discuss one-on-one with every patient about their dental options and what best fits their needs, as well as their budget. Because of our commitment to uncompromising attention to detail and treating our patients with respect and courtesy, we have become one of the area's most trusted dental offices. With extended evening and weekend office hours, you are sure to find a convenient time in your busy day to schedule an appointment. Thank you for visiting our website. On these pages you will find valuable information about us and our services. Whether you are a new or existing patient, if you have any questions feel free to contact us. We appreciate your interest in our practice and look forward to hearing from you. To speak to our knowledgeable staff concerning appointments, services, or insurance questions, call us at 203-937-9744 during office hours and we will be glad to assist you. We work with most major dental insurance plans including Connecticut State Dept. of Social Services Dental Insurance (HUSKY Health) for children and adults 21-years-old and younger.